Echinococcus multilocularis is a small tapeworm normally found in the intestinal tract of wild canids (e.g. coyotes, foxes) and sometimes dogs. For these animals, having this worm in the gut doesn’t cause a problem. The main concern is when something (or someone) ingests tapeworm eggs that are passed in feces of these canids. This can result in a condition called alveolar echinococcosis (AE), in which tumour-like parasitic cysts can develop in other parts of the body, particularly in the liver. In the normal (wildlife) life cycle of this tapeworm, wild canids shed eggs in their feces which are eaten by small rodents, that then develop AE. When a canid eats an infected rodent, the parasite grows into its adult stage in the canid’s gut and produces more eggs, and the cycle continues. While that’s bad for the rodents, the bigger problem is that this “intermediate host” stage can occur in more than rodents… including dogs and people. Alveolar echinococcosis has been diagnosed in a small number of Ontario dogs (with little to no travel history) since 2012, raising questions about how they got infected. The concern was that this parasite had become established in our wild canid population, which presents an ongoing risk to people and other animals, and is very hard to control. Human cases in Canada are rare but are being found and may be underdiagnosed. Since AE is a very nasty disease, and very difficult to treat, we’re inherently cautious. 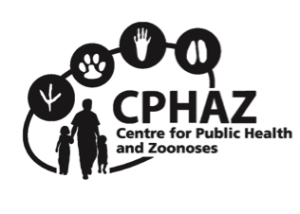 The recent news stories picked up on a study published earlier this year in Emerging Infectious Diseases (Kotwa et al 2019), where an astounding 23% of wild canids in Southern Ontario were found to be shedding Echinococcus multilocularis. What’s the risk to dogs in Ontario? We don’t know. I realize that’s not comforting but it’s the honest answer. We should know a lot more in the next few months as we test samples from pet dogs in the highest risk areas. Until then, it’s hard to say much with confidence. There are two main approaches to prevention: decreasing the risk of exposure and prophylactic treatment. We can treat dogs for tapeworms, but this isn’t usually part of routine deworming protocols, so only a small percentage of dogs are treated on a regular basis. I’ve been treating my dog with praziquantel monthly for the past couple of years, since emergence of the parasite was identified, because we’re in a higher risk area and he will eat anything. We live in the country and have a lot of coyotes around. If the parasite is here, it’s quite plausible he would be exposed. The risk is much lower (or non-existent, potentially) in other regions, and dogs that have less outdoor access are much lower risk. Quantifying that risk is the challenge. Ultimately, whether or not to treat a dog prophylactically is a case-by-case decision, based on the dog’s risk factors (and the owner’s risk aversion). More information about Echinococcus multilocularis can be found on the Worms & Germs Resources – Pets page. Also check out emultiontario.com and the updated infographic from the Ontario Animal Health Network. We’ll provide updates as more information about this parasite becomes available. A recent presentation at ECCMID (European Congress of Clinical Microbiology and Infectious Diseases) in Amsterdam described a series of linezolid-resistant enterococci in dogs and cats in the UK. I’m only able to get information from media reports, so details are limited (and potentially lost in translation); however, it’s an interesting story. It’s unsurprising in many ways, but highlights some important issues. Linezolid is an antibiotic that’s typically used in human medicine for infections caused by multidrug-resistant Gram-positive bacteria such as staphylococci (including MRSA) and enterococci. It’s rarely used in veterinary medicine, but has been used in dogs and cats for the same types of infections. Because it’s one of few options for treatment of MRSA in people, it’s an important drug, and resistance is a significant concern. The UK story involves a cluster of infections at one veterinary clinic. Enterococci that were resistant to linezolid were found in two cats and one dog. They were found to carry a gene, optrA, that confers linezolid resistance. This is the first time this gene has been found in a bacterium from a companion animal in the UK. optrA is found on a plasmid, a small piece of DNA that can be move relatively easily between bacteria, meaning it can potentially spread to other bacteria of the same species, or even to those of other bacterial species. There are no details in the reports I’ve seen about timing of the infections, and whether the cluster in the clinic was likely due to direct contact between animals, contact with a contaminated environment or contact with people who were either contaminated (e.g. carrying the bug on their hands from touching an infected animal or contaminated surface in the clinic) or colonized (i.e. people who harbour the bacterium in their intestines and can be a source of contamination themselves). Where did the linezolid-resistant enterococci originate? It’s hard to say from the limited information I’ve seen. It could have come from a person, as there are lots of instances of humans infecting their pets with a variety of bacteria. That’s largely how MRSA originates in dogs and cats, and other resistant bacteria that are common in humans have entered the pet population in this way. Use of linezolid in animals should not have played a role. Articles have stated that linezolid is not used in dogs and cats in the UK, and while I question whether that’s actually true, linezolid use is so rare to non-existent in pets that there’s probably no realistic risk of emergence of resistance from use of that drug in these species. However, optrA doesn’t just confer resistance to linezolid. It also confers resistance to chloramphenicol and florfenicol, drugs that are (uncommonly) used in dogs and cats. This highlights the “co-selection” issue, when the use of one drug can select for resistance in other drugs. I suspect a human source is more likely here but it’s hard to say. What this means in the big picture is hard to say, but it shows how resistant bacteria and resistance genes can move between and within species, sometimes in unexpected ways. It also shows how the common bug-drug-species focus (i.e. looking at one type of resistant bacterium in just one (human or animal) species) can miss the big picture. Antimicrobial resistance is a complex ecological problem that requires a complex and comprehensive approach, which is currently still lacking. I keep saying spring is approaching and I keep getting disappointed by the cold weather. But it’s going to happen soon, so we’ve been gearing up for tick season. There are a few new initiatives underway for tracking ticks and tickborne diseases in Canadian dogs and cats. Check out the recent post at PetsAndTicks.com for more information. The snowfall we had on the weekend notwithstanding, spring is here. As the weather warms up in Ontario (and other regions), we have to once again think more about ticks. Once the temperature reaches ~4C, hungry ticks that didn’t feed in the fall will come out, looking for food. Accordingly, tick prevention for people and pets needs to be considered. The return of ticks also means the return of pet tick preventative advertising, and that’s leading to confusion and questions. The “Lone Star Louie” ads, in particular, are leading to a rash (pardon the pun) of emails. They focus on the Lone Star tick (Amblyomma americanum), but also include some confusing, mixed and misleading messaging, talking about this tick in dogs, red meat allergy and Lyme disease. The Lone Star tick is an aggressive tick that can spread a few different diseases. We’re paying more attention to it in Ontario now because we expect it to become a problem over time. We see small numbers every year, and so far we’ve assumed that these are ticks have been carried north by migrating birds. Established populations (i.e. finding all life stages of the tick at a particular location, typically over at least a two year period) have not been recognized in the province (yet). However, we’re on the look out for it through initiatives such as our Pet Tick Tracker. This is a really interesting story but one that has no relevance to dogs and cats. Lone Star tick bites can result in an acquired red meat allergy in people. It’s uncommon, but bites from this tick can result in sensitization of peoples’ immune systems to a protein that’s found in red meat. People can get sensitized to it because it’s not a component of their bodies. In contrast, dogs and cats are made of that protein, so they can’t develop the same kind of red meat allergy (i.e. an allergy to themselves). So, while it’s a concern with this tick, it’s of no relevance to dogs and cats, and dogs and cats do not lead to people being exposed to the tick or developing the meat allergy. Lyme disease gets mentioned in the ad too, but this tick does not harbour the bacterium that causes Lyme disease (Borrelia burgdorferi). That particular pathogen is most often carried by black-legged ticks (e.g. Ixodes scapularis). So, the Lone Star tick is a concern (albeit still a minimal one in Ontario). However, red meat allergy messaging is irrelevant to marketing tick preventives for dogs and cats, and Lyme disease is not a risk from this tick. Tick prevention is important in dogs (and to a lesser degree cats) and the use of tick preventative medicine is an easy and effective way of reducing the risks associated with ticks. The messaging needs to be better, though, to avoid confusion and misinformation. Raw diets have been in the news a lot lately because of Salmonella contamination. It’s not surprising at all since bacteria like Salmonella, E. coli, Campylobacter and Listeria are expected to be found in raw meat (that’s why we cook it). We know that dogs and cats fed raw meat are at increased risk of shedding bacteria like Salmonella, sometimes with serious consequences to the animals or their owners. Reducing the risk is a challenge when you know there’s a reasonable chance the food is contaminated, and when the preferred method of control (cooking) isn’t used. Irradiation is an alternative approach, but not something in which a lot of raw feeders are probably interested. High pressure pasteurization (HPP) is therefore increasingly being used to help control bacterial contamination of these products. HPP, as the name suggests, uses high pressure (with minimal increases in temperature) to reduce bacterial loads. Notice I said reduce, not eliminate. That’s the problem. A while ago, I used to go on the assumption that raw food products that underwent HPP were similar in risk to commercial cooked diets, with the disclaimer that we don’t really know for sure. We still don’t know a lot, but what we know now isn’t encouraging, so I’ve had to change that assumption. I’ve talked to a few people who have done limited investigations of foods treated with HPP, and the results were disappointing. Unfortunately the studies were small and remain unpublished. A 2016 research abstract gives us a bit more substance (although a proper research paper would be preferred). In that study (Hasty et al. 2016, Reciprocal Meat Conference – Meat and Poultry Safety), raw beef pet food was spiked with E. coli. (A harmless strain of E coli was used in place of a disease-causing strain or other bacteria like Salmonella, presumably because of biosafety concerns.) They used a HPP process that subjected the meat to a standard pressure (600 mpa) for 480 seconds. Then they checked to see if any viable bacteria were left in the meat. The good news: There was a definite reduction in viable bacteria. The bad news: It didn’t kill them all. This doesn’t mean HPP is ineffective. It’s a matter of being aware of what it can do, and what it can’t. It can reduce the number of viable bacteria in the food, and that probably reduces the risk of disease in people and pets. But it does not eliminate all the bacteria, so it can’t eliminate the risk (only proper cooking and handling will do that). If someone is going to feed a raw diet, I’d still recommend using a HPP-treated diet versus one that has bot been treated. However, people have to realize it’s not a panacea and that they still have to assume the food is contaminated. There’s always some risk of bacterial contamination. We can reduce, but not eliminate, that risk. Careful handling is required to prevent cross-contamination of human foods, surfaces and environments. A little common sense when it comes to food handling can go a long way (but it’s amazing how uncommon “common sense” can be… check out Barfblog.com for annals of food safety stupidity). Raw meat diets should not be fed to dogs and cats at increased risk of serious disease (e.g. very young, elderly, pregnant, immunocompromised) or in households where people (or pets) fitting those categories are present. People who feed raw diets should make sure their veterinarian knows this, should their pet get sick. The same applies on the other side of the One Health spectrum – if someone is feeding raw meat to their pet and a person in the household has gastrointestinal disease, exposure to raw meat needs to be mentioned to the physician involved. More information about raw meat feeding and basic safety practices is available on the Worms & Germs Resources – Pets page. I’m taking a Brucella break to post a few interesting rabies stories. A rabies warning was issued to residents of Taloyoak, Nunavut in response to identification of rabies in “a number” of dogs and foxes (I’m not sure what that number is). This isn’t really new, as Arctic fox rabies is an ongoing endemic concern in northern Canada, including all of the territories. But it’s also an issue for other areas in Canada, because dogs are periodically shipped from Nunavut to southern regions. Vaccination rates are more variable in remote communities due to accessibility and population control issues, increasing the risk that rabies in the wildlife population could spillover into the dogs. Multiple dogs with rabies have been moved out of Nunavut to multiple provinces in the past. Skunks are a natural rabies reservoir in some regions, as an Arizona man found out recently. He was bitten by a skunk, which was subsequently determined to be rabid. Why, exactly, he was close enough to a skunk to be bitten is another question, and one that wasn’t evident in the news articles I saw. I don’t think people need a reason beyond getting sprayed to stay away from skunks, but rabies is another good one. …depending on the type of car. A woman was bitten by a stray kitten she was trying to feed outside Everglades National Park (take home message #1: stay away from wildlife and stray animals). She underwent post-exposure prophylaxis at a local hospital, only to later recieve a rather shocking bill of $48 512 (no, I didn’t misplace a decimal point). $46,222 of that was for the single immunoglobulin (antibody) injection she received. I don’t understand the US healthcare system, but that seems more than a little crazy. It seems even crazier based on a statement that the cost would have “only” been $9900 if she was bitten a couple of months later, after the hospital lowered its price. I guess someone made a nice profit off her rabies exposure. Goats aren’t at the forefront of species I think about when someone says rabies, but like any other mammal, it can happen. A big concern about rabies in goats is the fact that they sometimes get handled by a lot of people. Recently, a rabid goat was identified in South Carolina, resulting in potential exposure of 9 people.